Cops and politicians have been raising the alarm about a problem that doesn't exist. Fentanyl is serious business. The synthetic opioid is 50 times stronger than heroin and is linked to huge numbers of opioid overdose deaths. It may be mixed in with heroin or other powder drugs, producing a more potent high than users expect, and the results are too often fatal. So it's not surprising that claims that fentanyl has shown up in marijuana causes alarm bells to ring. But there's not a scintilla of evidence for it, and the claims are doubly damaging. Scaring pot smokers away from a substance that has no overdose potential is not a good thing, and neither is raising fears about opiated weed when weed may actually help  people suffering from opioid addiction. Still, like a vampire, the myth of marijuana laced with the deadly opioid fentanyl refuses to die. It first went nationwide in June, thanks to an Ohio U.S. senator's press conference, and while a VICE debunking  at the time should have driven a stake through its heart, it has reared up once again this month, most recently thanks to a local prosecutor in Tennessee. "There are some marijuana dealers that will tell their clients that I have no doubt there is fentanyl in it and some of the more addictive folks, especially folks that also use other drugs, will get that marijuana laced with fentanyl in hopes of getting a better high," District 24 Attorney General Matthew Stowe told a credulous WKRN-TV  in an interview last week. "The bottom line is, anyone, anywhere could mix fentanyl and marijuana and there's no way of knowing it until it's too late." But wait, there's more: "Marijuana laced with fentanyl can be extremely deadly and to anyone who touches it, taste it, smokes it [or] anything else of that nature," Stowe claimed. "If it's laced with fentanyl, marijuana can be the deadliest drug there is." Marijuana laced with fentanyl would be deadly -- if such a thing existed. There is no evidence it does. There are a couple of reasons such a concoction is unlikely. 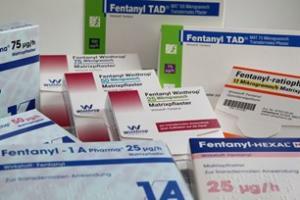 First, fentanyl is typically a white powder and, unlike drugs such as heroin or even cocaine, which are also powders, marijuana is green plant material. Buds adulterated with white powders would look like buds adulterated with white powders. Secondly, no one even seems to know if smoking fentanyl in weed would even work. Chemist Kirk Maxey, who helps law enforcement agencies like the DEA test suspected synthetic opioids, told VICE he doesn't know if it's scientifically possible. "Documenting the pipe chemistry of fentanyl in leaf material would be a research paper," he said. "And I don't think it's been done yet." Still, such obvious objections haven't stopped the spread of the myth, which may have originated in a February Facebook post  from the Painesville Township Fire Department in northeast Ohio. That post, which quickly went viral, reported that three men had reported overdosing after smoking "marijuana laced with an unknown opiate." It was picked up by a local ABC TV affiliate, which reported "three separate incidents, but all with the same result -- overdoses from opiate-laced marijuana." It wasn't true. As Cleveland.com reported  shortly afterward, toxicology results showed that "the three people who claimed they had overdosed on marijuana laced with an unknown opiate actually used crack cocaine and other drugs." The media hubbub died down, but the seed was planted, growing through the spring in the fertile soil of an Ohio gripped by a deadly opioid epidemic and filled with policemen and politicians willing to fertilize it with healthy doses of manure. In June, it blossomed. "Marijuana laced with fentanyl: police warn of another potentially dangerous drug mixture," News 5 Cleveland reported  on June 14. There weren't any actual cases of the pot/fentanyl mixture showing up, but "police said the warning was necessary to alert people, especially parents, to the potential risk." And politicians. Five days later, Ohio U.S. Senator Rob Portman (R) held a Cincinnati press conference on the opioid crisis with Hamilton County Coroner Lakshmi Sammarco, whose reported remarks helped give the myth new life. "We have seen fentanyl mixed with cocaine," said Sammarco. "We have also seen fentanyl mixed with marijuana." The comment rocketed around the web, rousing alarm and raising the specter of innocent pot smokers felled by deadly adulterants, but there was less to it than meets the eye. When, unlike other media outlets that simply ran with the story, VICE actually reached out to Sammarco, the story fell apart. Sammarco said her quote had been misinterpreted and that her office hadn't actually seen any fentanyl-laced weed. Sammarco told VICE that Sen. Portman had mentioned to her that it had been spotted in northeast Ohio -- apparently based on that erroneously News 5 Cleveland report. When VICE contacted Portman's office about the origin of the fentanyl in weed story, spokesman Kevin Smith replied only "I don't have anything on that," before hanging up the phone. Despite the baselessness of the claim, it was back again this month. Police and health officials in London, Ontario , sent out warnings after people who claimed to have only smoked pot came back positive for opioids on urine drug tests, without ever considering the possibility that those people weren't telling the truth. Canadian Federal Health Minister Jane Philpott had to step in to put a stop to the nonsense: "We have confirmed this with chiefs of police [and] law enforcement officials across this country -- there is zero documented evidence that ever in this country cannabis has been found laced with fentanyl," she told the London Free Press . "It's very important that we make sure that that message is clear." That didn't stop police in Yarmouth, Massachusetts , from generating a similar story just days later. It was another case of a man who overdosed on opioids claiming to have only smoked pot. Police there said they "believe that is possible that the marijuana was laced with fentanyl, which police are starting to see more and more across the country." Except they're actually not. That first batch of fentanyl-laced marijuana is yet to be discovered. But that hasn't stopped prosecutor Stowe any more than it's stopped the other cops, politicians, and hand-wringing public health officials from propagating the misinformation. This is Reefer Madness for the 21st Century.